The Sunshine Aquarium—located atop an entertainment complex in the Ikebukuro district of Tokyo—features a unique ring-shaped see-through tank perched seven-and-a-half feet over guests that usually lets them watch the facility's seal population swim laps. 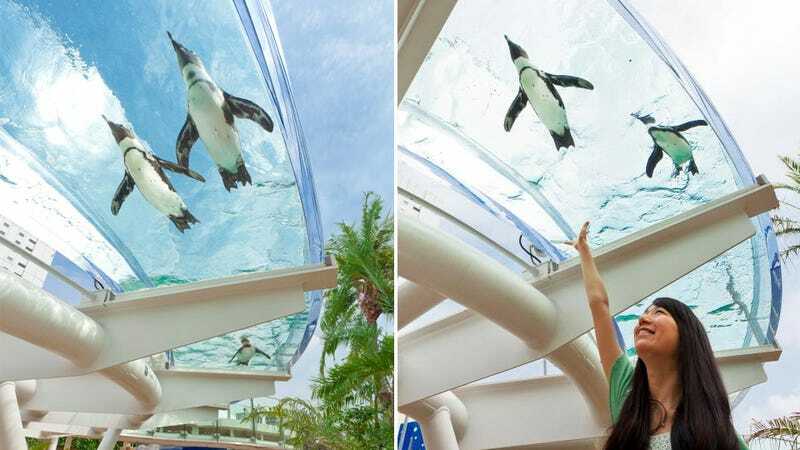 But this summer the aquarium's added a special penguin exhibit, and every evening the birds are given exclusive access to the Aqua Ring which presumably gives them a small taste of what it might be like to fly. During their nightly excursion in the circular tank the seals are kept at bay given they're one of the penguin's natural predators. And because having an up-close view of what might happen should a penguin and seal meet might not be particularly enjoyable for the aquarium's younger guests.